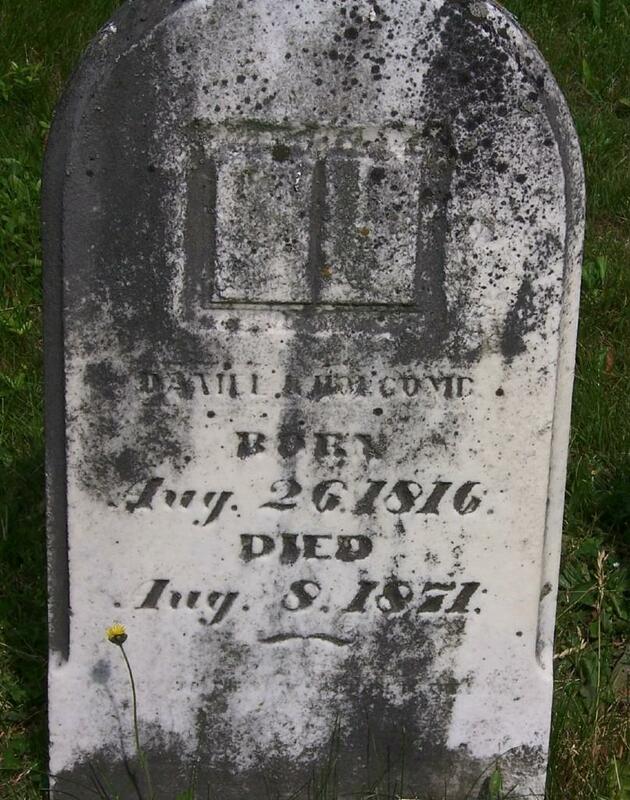 Mary Loomis was born on 20 March 1672 at CT. She was the daughter of Deacon John Loomis and (?) Unknown 1st Wife. Mary Loomis married Deacon John Buell, son of Samuel Buell and Deborah Griswold, on 20 November 1695 at Windsor, Hartford Co., CT.2 Mary Loomis died on 4 November 1768 at Windsor, Hartford Co., CT, at age 96. [S137] Elisha Scott Loomis, Joseph Loomis, Page 134/Item 105. Hezekiah Porter was born on 9 November 1673. He was the son of John Porter II and Mary Stanley. Hezekiah Porter married Mary Buell, daughter of Samuel Buell and Deborah Griswold, on 22 July 1699 at Killingworth, New London (now Middlesex) Co., CT.2 Hezekiah Porter died on 29 June 1757 at age 83. [S52] Henry R. Stiles History of Ancient Windsor II, Vol. II:Pg. 621/Family 5. McCracken cites the East Windsor Church Records. [S810] Edwin W. Strickland II, William Buell, 1-8, page 21. Sgt. Joseph Porter was born on 7 February 1675. He was the son of John Porter II and Mary Stanley. Sgt. Joseph Porter married Hannah Buell, daughter of Samuel Buell and Deborah Griswold, on 5 December 1699 at Killingworth, New London (now Middlesex) Co., CT.2 Sgt. Joseph Porter died on 29 September 1741 at age 66. [S52] Henry R. Stiles History of Ancient Windsor II, Vol. II:Pg. 621/Family 6. McCracken notes that Stiles listed the birth as 1678 which would conflict with brother David's birth. McCracken notes that Stiles listed her as having died young and also alleged to have married Nathaniel Porter, which is possibly an error for her sister Deborah's marriage to a man of that name. [S810] Edwin W. Strickland II, William Buell, 1-8, page 26. John Barber was baptized on 24 July 1642 at Windsor, Hartford Co., CT. He was the son of Sgt. Thomas Barber and Jane (?) John Barber died on 17 January 1711/12 at age 69. [S169] M.D. Donald S. Barber, Thomas Barber 1st Ed, Page 4/Item 2. Sarah Barber was born at Windsor, Hartford Co., CT. She was the daughter of Sgt. Thomas Barber and Jane (?) Sarah Barber was baptized on 19 July 1646. [S169] M.D. Donald S. Barber, Thomas Barber 1st Ed, Page 2. Samuel Barber was born at Windsor, Hartford Co., CT. He was baptized on 1 October 1648. He was the son of Sgt. Thomas Barber and Jane (?) Samuel Barber married Mary Coggins on 1 December 1670 at Windsor, Hartford Co., CT.3 Samuel Barber married Ruth Drake, daughter of John Drake and Hannah Moore, on 25 January 1677. [S169] M.D. Donald S. Barber, Thomas Barber 1st Ed, Page 6/Item 4. Mary Barber was born at Windsor, Hartford Co., CT. She was the daughter of Sgt. Thomas Barber and Jane (?) Mary Barber was baptized on 12 October 1651. She married John Gillett, son of Jonathan Gillett and Mary Dolbiar, on 8 July 1669 at Windsor, Hartford Co., CT. Mary Barber died on 29 March 1725 at Suffield, Hartford Co., CT.
Lt. Josiah Barber was baptized on 15 February 1653 at Windsor, Hartford Co., CT. He was the son of Sgt. Thomas Barber and Jane (?) Lt. Josiah Barber married Abigail Loomis, daughter of Nathaniel Loomis and Elizabeth Moore, on 22 November 1677 at Windsor, Hartford Co., CT.3 Lt. Josiah Barber married Sarah Porter, daughter of John Porter II and Mary Stanley, on 5 November 1701 at Windsor, Hartford Co., CT. Lt. Josiah Barber died on 14 December 1729 at Windsor, Hartford Co., CT, at age 76. [S169] M.D. Donald S. Barber, Thomas Barber 1st Ed, Page 9, Item 5. [S298] Donald S. Barber, Thomas Barber 2nd Ed, Page 8, Item 5. Mary Barber was born on 11 January 1666 at Windsor, Hartford Co., CT. She was the daughter of Lt. Thomas Barber and Mary Phelps. [S135] Judge Oliver Seymour Phelps Phelps Family, Vol. I:Pg 97/item 59. [S169] M.D. Donald S. Barber, Thomas Barber 1st Ed, Page 6. Sarah Barber was born on 12 July 1669 at Windsor, Hartford Co., CT. She was the daughter of Lt. Thomas Barber and Mary Phelps. Sarah Barber died on 31 March 1748 at age 78. [S135] Judge Oliver Seymour Phelps Phelps Family, Vol. I:Pg. 97/Item 60. Joanna Barber was born circa 1670 at Windsor, Hartford Co., CT. She was the daughter of Lt. Thomas Barber and Mary Phelps. [S135] Judge Oliver Seymour Phelps Phelps Family, Vol. I:Pg. 97/Item 61. [S135] Judge Oliver Seymour Phelps Phelps Family, Vol. I:Pg. 113/Item 62. Jonathan Higley was born on 16 February 1675 at Simsbury, Hartford Co., CT. He was the son of Capt. John Higley and Hannah Drake.3 Jonathan Higley married Anne Barber, daughter of Lt. Thomas Barber and Mary Phelps, on 4 December 1701 at Simsbury, Hartford Co., CT.4,5 Jonathan Higley died in May 1716 at age 41. [S135] Judge Oliver Seymour Phelps Phelps Family, Vol. I:Pg. 113/Item m62. [S52] Henry R. Stiles History of Ancient Windsor II, Vol. II:Pg. 389/Family 1. Thomas Barber III was born on 7 October 1671 at Simsbury, Hartford Co., CT. He was the son of Lt. Thomas Barber and Mary Phelps. Thomas Barber III married Abigail Buell, daughter of Sgt. Peter Buell and Martha Cogan, on 25 May 1699 at Simsbury, Hartford Co., CT.5 Thomas Barber III died on 17 July 1714 at Windsor, Hartford Co., CT, at age 42. [S52] Henry R. Stiles History of Ancient Windsor II, Vol II:Pg 50. [S135] Judge Oliver Seymour Phelps Phelps Family, Vol. I:Pg. 114/Item 63. Samuel Barber was born on 17 May 1673 at Simsbury, Hartford Co., CT. He was the son of Lt. Thomas Barber and Mary Phelps. Samuel Barber married Sarah Holcombe, daughter of Nathaniel Holcombe and Mary Bliss, on 17 December 1712 at Simsbury, Hartford Co., CT.3,4 Samuel Barber died on 18 December 1725 at Simsbury, Hartford Co., CT, at age 52. [S135] Judge Oliver Seymour Phelps Phelps Family, Vol. I:Pg. 114/Item 64. [S169] M.D. Donald S. Barber, Thomas Barber 1st Ed, Page 12/Item 9. [S810] Edwin W. Strickland II, William Buell, 1-8, page 51. Mary Marsh married Moses Seymour. Mary Marsh was the daughter of Col. Ebenezer Marsh and Deborah Buell. Moses Seymour married Mary Marsh, daughter of Col. Ebenezer Marsh and Deborah Buell. Govenor Seymour was the son of Moses Seymour and Mary Marsh. Judge Seymour was the son of Moses Seymour and Mary Marsh. Christopher Holcombe was born in 1560. He was the son of Thomas Holcombe and Margaret Tretford. Christopher Holcombe was baptized on 15 January 1560/61.2 He married Barbara Jege. Barbara was from Ireland. They had children on the Walter/Harry Chart. Roger, Gilbert, Nicholas and Jane have also been listed under Josias. [S65] Deanna Holcomb Bowman Thomas Holcomb, Vol. II:Pg. 167/Item 112112. [S65] Deanna Holcomb Bowman Thomas Holcomb, page 212. Of Ireland. Barbara Jege married Christopher Holcombe, son of Thomas Holcombe and Margaret Tretford. William Holcombe was born circa 1586. He was the son of Christopher Holcombe and Barbara Jege. William Holcombe died in 1662. Bowman states: "... will proved in 1662, in Wales naming his wife Edith and mentioning but not naming children. He left 10 pounds each to his children and to his wife Edith the lease of Brownslade, Jeffreston and Sumerton in the parish of Moncton. His son-in-law, Lewis Loueles, Mr. Richard Browne, and Mr. Henry Bishop to be overseers. The value of his estate was 95 pounds plus." [S65] Deanna Holcomb Bowman Thomas Holcomb, Vol. II:Pg. 169/Item 1121122. Marriage is listed in both Crediton and Chardstock. However, after years of research, Deanna Holcomb Bowman believes that the dates and marriage assigned to this Thomas are actually those of Thomas, the actor of London, and that this is the Thomas who immigrated to the colonies and founded the "Northern Branch" of the Holcomb(e) family in the United States. Thomas Holcombe was born in 1601. He was the son of Christopher Holcombe and Barbara Jege. Thomas Holcombe married Joan Prideaux in 1622. Thomas Holcombe died in 1625. Her last name was later spelled Prouz. Joan Prideaux married Thomas Holcombe, son of Christopher Holcombe and Barbara Jege, in 1622. Roger Holcombe was the son of Christopher Holcombe and Barbara Jege. Roger Holcombe died in 1648. Gilbert Holcombe was the son of Christopher Holcombe and Barbara Jege. Gilbert Holcombe died in 1619. Nicholas Holcombe was the son of Christopher Holcombe and Barbara Jege. Jane Holcombe was the daughter of Christopher Holcombe and Barbara Jege. Bowman lists this child as "possible." John Holcombe was baptized at St James, Clerkenwell, England. He was born in 1609. He was the son of Christopher Holcombe and Barbara Jege. Daniel and Julia were enumerated in the 1850 Sparta Twp., Dearborn Co., IN, federal census living next to his father. Children in his household were Nancy E. age 4, Sarah D. age 8/12, and Luther H. age 3. In addition a child, Ezra Knapp age 2, was listed after Nancy. Daniel and Julia Ann were enumerated in the 1860 Sparta Twp., Dearborn Co., IN, federal census, page 20. He was a farmer age 43, born in NY; she was 40, born in IN. Children in the household, all born in IN, were Nancy E., age 14; Sarah D., 10; Daniel, 7; Mary, 4, and Amanda, 1. There were two boarders in the household. Daniel and Julia A. were enumerated in the 1870 Sparta Twp., Dearborn Co., IN, federal census, page 7. He was a farmer, age 54, she was 49. Children in the household, all born in IN, were Nancy 24, Sarah 20, Daniel 17, Mary 14, Amanda 11, Martha 4, and Walter 10. Walter could be either nephews Walter Scott Holcombe or Walter L. Holcombe, but the ages don't exactly match. Julia was enumerated in the 1880 Moores Hill, Sparta Twp., Dearborn Co., IN, federal census, ED 52, page 29. She was 59. Children in the household were Sarah 30, a milliner, Amanda, 21, a milliner, and Mattie, 14. 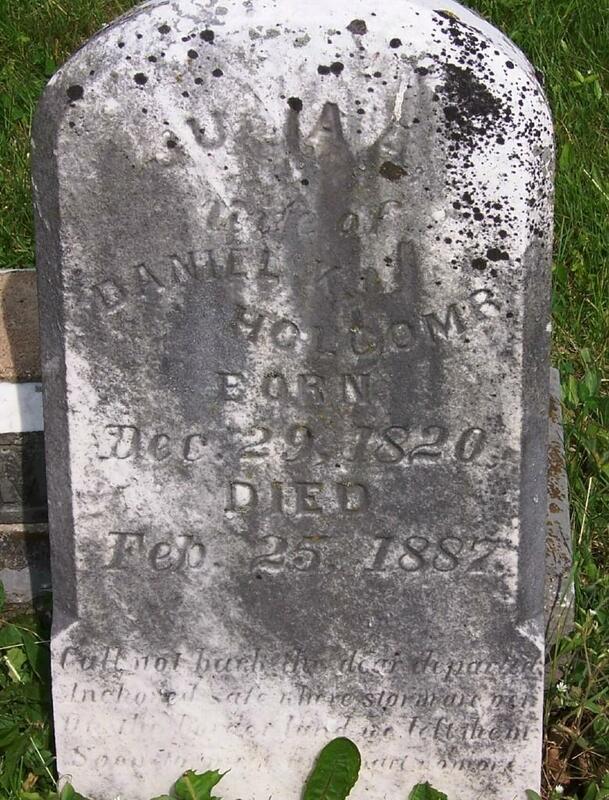 Ethiel Porter Holcombe was born on 1 January 1818 at IN. He was the son of Rufus E. Holcombe and Nancy Gloyd. Ethiel Porter Holcombe married Ellen Oliver on 11 May 1843 at Ripley Co., IN. Ethiel Porter Holcombe died in 1884 at Iriquois, Kingsbury Co., SD. Ethiel and Ellen were enumerated in the 1850 Sparta Township, Dearborn Co., IN, federal census, roll M432-141, stamped page 446. He was a cooper, age 28. Children in the household were Oliver E. age 5, Elijah 3, and a son age 1. Ethiel and Ellen were enumerated in the 1860 Arlington, Columbia Co., WI, federal census. He was a farmer, age 37, she was 36. Children in the household were Oliver 16, Elijah 12, Cerif 10, Edward A. 8, and George F. 3. "Peter"l and Ellen "Houlcomb" werre enumerated in the 1870 Arlington, Columbia Co., WI, federal census. He was a farmer, age 47, she was 46. Children in the household were Elijah 23, Herif 21, Edward 17, and George 13. Ethiel and Ellen were enumerated in the 1880 Arlington, Columbia Co., WI, federal census, ED 16. He was a farmer age 63, born in NY; she was 62, born in Indiana. Next door was Edward Holcombe, age 28, born in Indiana, with wife Nancy age 21 and two children, John 4, and George 1, both born in WI. George Holcombe is boarding nearby, he was born circa 1858 in IN, and his father was born NY, mother IN. Son Elijah appears to be in Lodi, Columbia Co. with wife Lydia and son William. He is 35 born in IN.